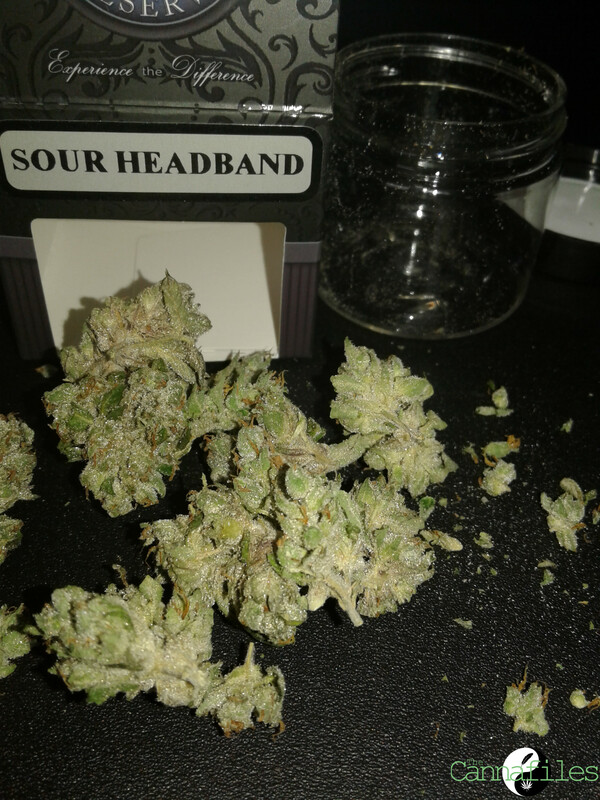 Sour Headband fuses together a double dose of East Coast Sour Diesel with a bit of kush and a touch of skunk. It’s East Coast meets East Coast meets West Coast. The lineage for Sour Headband is Sour Diesel crossed with Headband. Headband is a blend of OG Kush and East Coast Sour Diesel, and Sour D is a hybrid of Chembdawg and DNL, a strain that brings in some RFK Skunk crossed with a Hawaiian Sativa. This was further crossed to an Afghan-heavy Northern Lights. A fuzzy, heady stone with a predominance towards paralysis by analysis. At the end of the day, they’re all hybrids. Digging into lineage history about strains, looking into the stories of old hippies and cultivars is like skip-tracing a ghost. Myth and legend so grand and elaborate, when it comes to old hippies and their crazy strains of mind-altering weed—it rivals the Greeks and Romans. From what I am able to gather—and this is all allegedly circumspect and circumstantial—it always comes down to a bag of seeds shared amongst old friends. Cuttings traded over an ounce smoked during a Grateful Dead show. OG Kush and all her phenotype cousins like Tahoe, SFV, Abusive, Larry, et cetera—all of them are purportedly variations from the same bag-seed from back in the day. One seed pops, hermies, backcrosses to itself and you see God in the burning bush. Maybe you throw in a savvy breeder with enough time and love, you might get a bit of magic. Chemdawg has a similar story only it seems there were four possible variations. Bring them together with some pollen brought into the world from a plant grown from another bag of unknown seed and voila—you have cannabinoid soup. This breeder grows his holy grail. They trade cuttings, seeds, pollen. A joint, a spliff, four bong rips later, time passes and new strains are grown, each selectively bred for selectively awesome qualities, bless their pointed little heads. Breeders, growers, cultivars, all doing their part to create the perfect strain, the holy green grail. They share some of that perfection with some friends and that perfection’s love is further turned and churned and spread across the world, one love, be love, spread love. Give it a name—it’s kush from the indicas mountains or it’s kush grown by the ocean, it’s skunk loving blended to life, maybe it’s haze… it’s cannabis, my friend. They are all hybrids and they are all brought to life as the culmination of years or decades, sometimes generations of pure love and sweat and dirt. Taxonomic descriptions be damned, each bag is a representation of someone’s pure joy, regardless of corporation or regulation. When you have a relationship with weed, it’s not about East Coast or West Coast. There is no coast because they’re all hybrids. One love, be love, spread love. So let all the myths and legends be what they be. When it finally comes down to the nitty-gritty, what matters is what’s in the bag and how she smokes. Cannabinoids, terpenes, flavonoids, they all must come together in a symphony of synergistic love as chemotype, shirking taxonomic phenotype, selectively bred for reason, for purpose. And when it comes to this sativa-leaning hybrid from Seattle’s Private Reserve, the buds in my jar are thin and spindly. Nugs have a nice frostiness to them with a sweet sage and pine aroma. Buds are dry and light to the touch. Under the scope, the trichomes are predominately sessiled. What few stalked and topped trichomes there are have a nice clear crystalline color. Many stalks are thin and/or broken. Breaking the buds open, I hear a distinct "snap and crunch." There’s a slight increase to the aroma of pine after grinding. I notice a touch more earthiness too but she grinds into a powdery kief. Flavor is mostly a flat tasting sage, not much going on other than a hint of earthy pine that is very fleeting. She smokes hot. First hit is smooth but then she gets rougher as she goes. Effects are slow to rise. Mostly a warm fuzz around the edges. Two bowls and the only difference is the feeling of a slight pressure around the crown of the head. This is something typical of Headband, thus the name. Usually, this is a pleasant feeling but not if you’re prone to headaches. Migraine sufferers should take notice. The pressure here is more like Headband-light. And though there’s a softening to the head effect that feels typical of Sour Diesel, as far as flavor there was not much to lead me to believe she had so much genetic code inside. Nothing in the body to speak of, and as the effects wane there is a gentle sedation. The high is decent, if slightly understated. There’s a nice aftertaste I’m beginning to notice: sour. There she is. It took a minute, but that sour note made famous in Sour Diesel has finally come through, albeit softly and sans the diesel. Keep track of all the weed you love to smoke with your very own cannabis journal. Get your copy of The Cannafiles today, only at Amazon.